Would you like to add a new entry to this page? Would you also delete any information about past events? To do so, click on edit this page above. All URLs should start with "http://" (without the quotes). Want to learn more about how to add or edit pages in this calendar? Click here. We’re excited to announce that registration is now open for MyHeritage LIVE — our first ever international user conference! 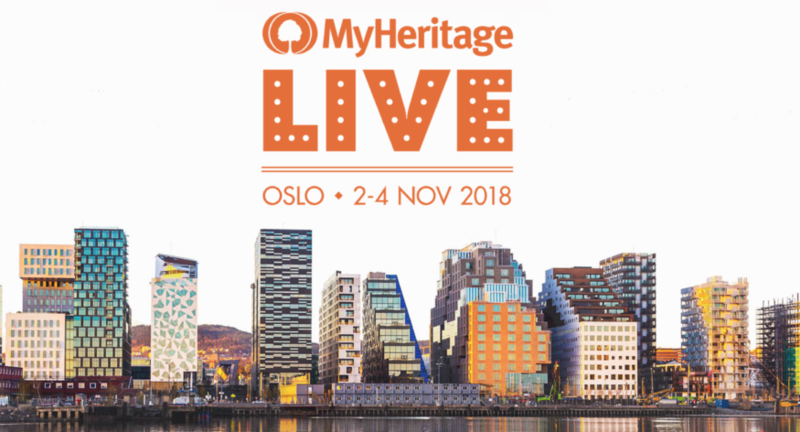 MyHeritage LIVE will take place on the weekend of 2–4 November 2018 in Oslo, Norway and we’d love for you to attend. It’s open to anyone, from anywhere in the world, who would like to learn more about MyHeritage – including subscribers, DNA customers, those with free basic accounts, and those who haven’t used MyHeritage yet but would like to find out more. The conference will feature a keynote speech from MyHeritage Founder and CEO, Gilad Japhet, international guest speakers and lectures from senior MyHeritage staff members. There will be three tracks: genealogy, DNA, and hands-on workshops, designed to suit all levels of experience, plus plenty of opportunities to ask questions and meet other MyHeritage users. Tickets include entry to the Friday night reception, keynote speeches, and all conference sessions. They also include lunch and coffee breaks on Saturday and Sunday and entry to the exclusive MyHeritage LIVE party on Saturday night. Space is limited so please reserve your spot ASAP, before the Early Bird discount ends! For a list of nearby hotels, details of how to get to the venue from Oslo airport and other information, please check the FAQs on the MyHeritage LIVE website. This Calendar is sponsored by Eastman's Online Genealogy Newsletter. This page was last updated 23 Jul 2018 15:23.